This is a long overdue post... a restuarant review post which I should have posted weeks ago before I had to go to Korea,India and Sydney...In fact, 3 hours before my departure for Sydney last week, I was still taking photos of the grilled calamari which I had been inspired to cook from my lunch at F.I.S.H. I am suspecting that people staying at the East side of Singapore may be more familiar with this innovative dining option offered by Fish & Co. Group. 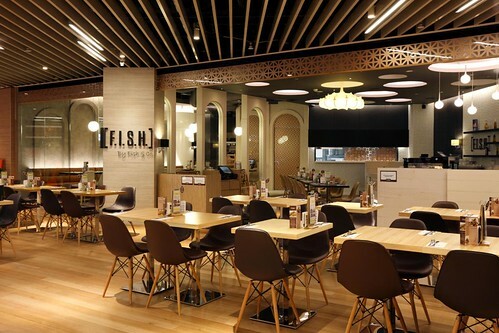 First opened at Tampines One, F.I.S.H offers a more eclectic selection of western cuisine originally targeted at their usual Fish&Co clientele base. Though why would they continue to target at their Fish & Co Clientele base was quite beyond me but sometimes, market forces take one by suprise and in this case, I believe it has turned out to be a pleasant suprise for Fish & Co.
Unwittingly, the F.I.S.H dining concept,that includes the exotic mediterranean fusion flavours ,the fresh quality produce at their salad bar and the trendy chic decor, has a unique appeal for the young trendy working crowd. F.I.S.H's latest and 2nd outlet opened at 313@Somerset - my favourite establishment among the slew of new retail malls that has dotted the shiny new Orchard Road. 3. The desserts air flown from US. 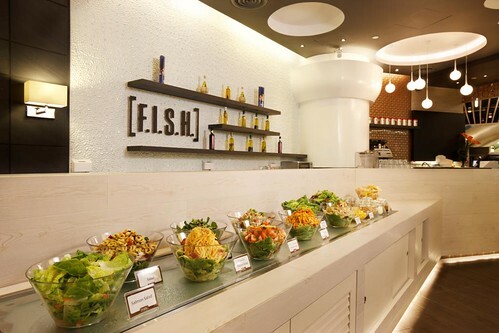 The cosy salad bar has quickly become one of F.I.S.H's signature feature. When you see well manicured baby spinach leaves sitting resplendently in a salad bowl all by itself, you know you will be eating well. Apart from the standard greens,the Salad Buffet bar also offers other more sophisticated prepared salads such as Garden Tomatoes with Basil, Prawns Pineapple Mint, Chilli Crab Salad and Shitake & Enoki Mushroom Salad. The spread varies everyday. 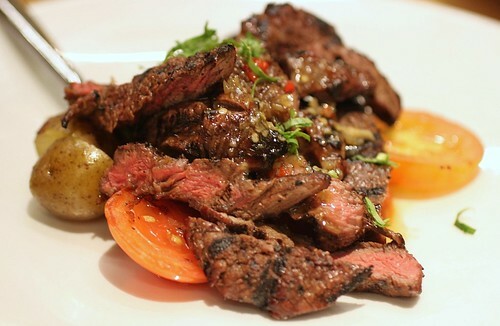 On its own, it costs $12.90++ but can be added on to any main course for $5.90++. Most of the main courses that comes with the salad buffet will not cost more than $20++ anyway. We all loved the starters. We cannot imagine anyone not liking the crispy Silver Fish. 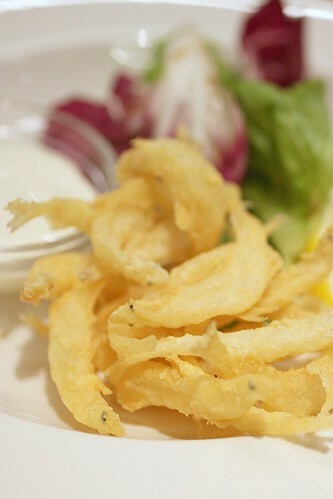 Batter coated and fried to a savoury crisp, this is one dish that would go well with a cold cold beer. The char grilled peri peri squid is my favourite. Seasoned simply with various paprika and chilli spices, this was char grilled to a perfect smoky flavour without turning it into rubber bands. 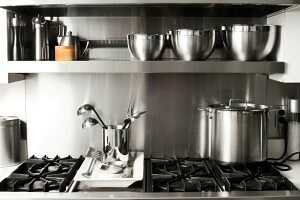 And yes, for those of us who love to cook, you would bookmark it immediately to duplicate at home... So there you have it, a side by side comparison of my version and F.I.S.H's version... taste is definitely different but when you don't have the chef's recipe, you will just have to improvise on your own... 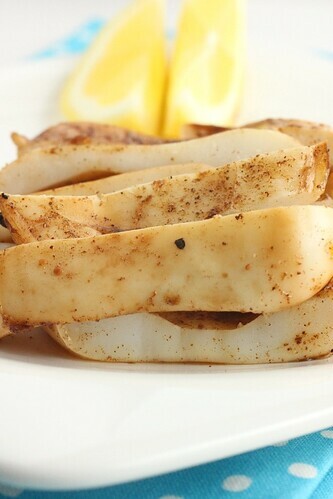 I will probably get closer if I return to F.I.S.H and make a few more orders of the Char Grilled Peri Peri Squid! Before I proceed to talk about their air flown desserts,I should follow the dining sequence and talk about our main-dish experience. Apart from the Hei Bee Hiam Spaghetti, we were not disappointed with the main courses but neither were we blown away. The Terriyaki Ribeye Steak(S$16.90++) was tender and juicy.However, we struggled to identify the Terriyaki flavour - The beef appeared to be slightly char grilled(which was great) and we wondered if it was due to that that the Terriayki sauce had morphed to resemble a satay sauce...Tasty dish and we were happy with the flavours. 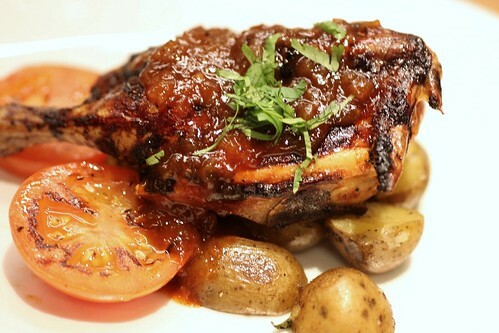 The Grilled Monzambique Spring Chicken ($16.80++ with Salad)is supposedly one of F.I.S.H's signature main courses. An exotic burst of sweet,sour and spicy flavours greet you at first bite. Flavourful and appetizing,no doubt but it did not leave a lasting impression with me. 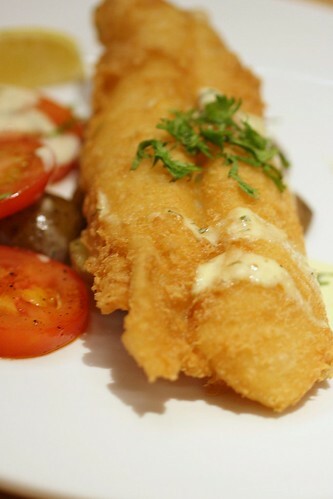 You can't go wrong with The Fried Mediterranean Fish ($14.80++ with Salad). The battered fried fish is Fish&Co's forte and we knew it was a safe choice when we ordered this. Coated with a light, thin, cripy batter, this was truly delicious and I could now understand why Fish&Co got so popular. Up to that point, we had not found a single main course dish that had cast an impression compelling enough to draw us back again. Both the Raspberry Eruption Cheesecake ($6.95++) and the Chocolate Pecan Cluster($6.95++) were brilliant. Air Flown from US, these are rich, glorious and indulgent with a cup of Illy's coffee. (yes, they serve Illy's coffee) My colleague was a happy lady when she dug into these and gaily declared that she would come back just for cake and coffee anytime. I have no doubt that F.I.S.H will catch on with the local diners here. Priced lower than Fish&Co, offering great quality Halal food, it probably already has carved out a market position for itself. When I went for my lunch during the Ramadan Fasting month, things were quiet but when I returned one evening 2 weeks ago, the place was jam packed and bustling. 1. In a zip lock bag, mix smoked paprika, cumin, salt,pepper,Cayenne and garlic together. 2. Add Olive oil to (1) and mix until a paste is formed. 3. Scoop out 2 tbsp of the paste and place in a bowl, add lemon juice, and stir to combine. 4. Add squid to the remaining paste in the zip lock bag. Marinate for 1 hour. Air flown desserts?! 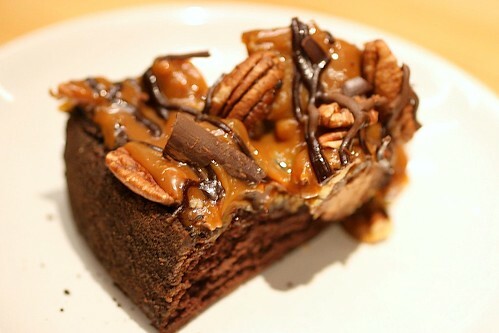 I can't imagine a restaurant having to fly desserts over but looking at that chocolate pecan pie looks divine - I may have to fly to Singapore for it! LOL! The food looks delicious! And are air flown desserts common in Singapore? :o Wow! I hope you enjoyed Sydney! Lorraine, no it is not common to air freight dessert over. They claim that the boss really liked these dessert when he tasted them in the US and felt it would fit well with the restaurant's concept. Bee, yes, you should go and try it out. They have kids menu which My friend told me is cheaper than Fish&Co. wow. going out of their way to fly in desserts? really? that's quite a statement. definitely have to give it a try. Fish & Co is not bad, but something akin to fast food. this looks a bit better. 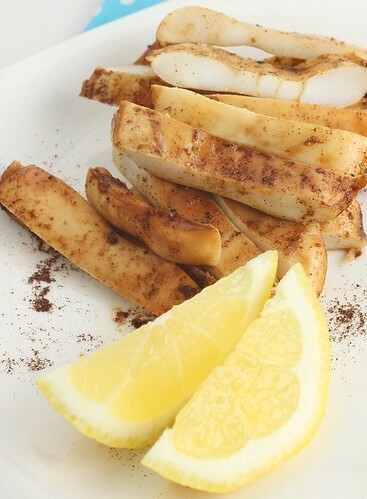 and thanks for the grilled squid recipe! was just frying up calamari the other day thinking there was just too much fried foods in my meals. Shirley, the food looks good and air flown dessert, I must go and try! a very cosy restaurant, I like ! and the squid look so yummy. the salad bar looks impressive. Apart from their leafy salads, they have some pretty interesting deals like the prawns pineapple mint and the chili crab salad. If I ever pay a visit, I will be sure to tag the salads along. main course wise, the spring chicken looks promising. I am actually more drawn to the desserts. Both looks seriously good. I will want to try the raspberry cheesecake eruption. 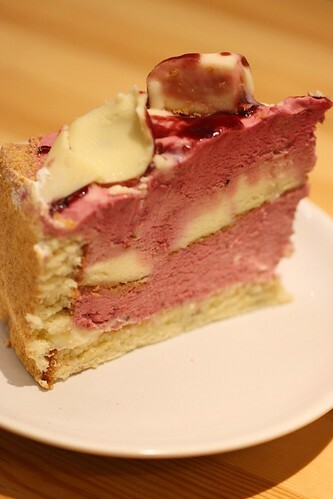 It looks like a sponge cake base instead of the usual crushed digestive biscuites one we have here, and the cheesecake looks like some ice cream pie. Beautiful place and beautiful food. Awesome desserts. Can't believe they are air flown from US...that part I just don't get it! Must be very special. I like the restaurant...the salad bar looked like it's not finished with all the preparation and decoration.....but the spring chicken and cheesecake look splendid! Gee, the salad bar looks really good. I would love to go for the salad though. 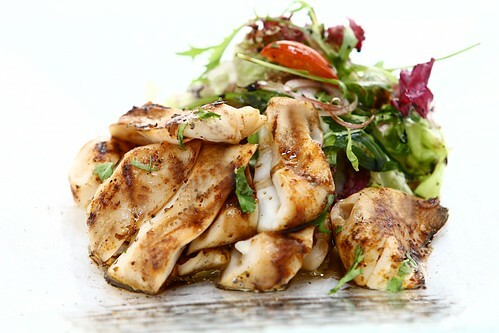 Your char grilled peri peri squid looks really good too! I would love to try this. Thanks for sharing your recipe. At a glance at the first two pictures I thought they were grilled chicken. The Calamari look so thick. The food looks great in this restaurant. This definitely sounds like a winner for Fish & Co. - great reviews. Will have to give this new place a try soon. Squid used to scare me when I was younger but then I fell in love with fried calamari and then came to like other ways of eating it too. This looks simple and delicious. Thanks for the recipe! wow everything looks good! 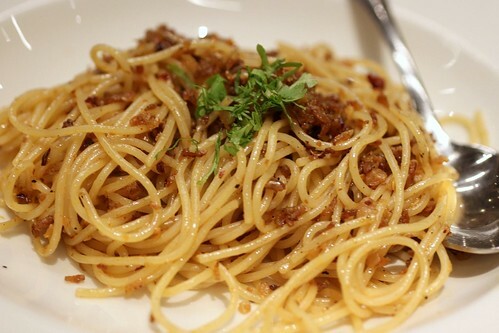 I want to try that hay bee hiam spaghetti! WOW! Great info. The ribeye looks very delicious as well as the Hay Bee Hiam. Beside, the desserts are so tempting for me. Thanks for sharing! This food all looks so enticing - but I especially love the look of the golden squid at the top of the post. YUM! Too bad the Hae Bee Hiam spag is a disappointment! I was so anticipated to read your good review about it but nah....too bad! 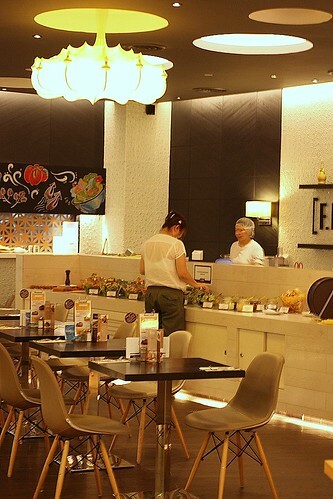 I frequent their branch in Tampines 1 and so far, I have no complain about their food. Thanks for sharing the recipe, will try it one day. Well, you certainly know how to get me drooling even AFTER I've already eaten lunch. Everything looks amazing! I want those cheesecakes. Badly.